If you spent the summer diving into swimming pools and eating snow cones for relief from the unrelenting heat, let us cool you down with the latest news about icebergs. In July an iceberg bigger than the city of Chicago broke away from the Pine Island Glacier, Antarctica. The gigantic chunk, measured at some 720 sq. km (about 278 sq. mi. ), is now floating freely in the Amundsen Sea, part of the great Southern Ocean. German scientists are tracking the big berg with a satellite named TerraSAR-X. The Pine Island iceberg is one of many that have been cracking and crashing off of Antarctic and Arctic glaciers in recent years. In fact, many scientists agree that were the Titanic to sail today, it would encounter quite a few more icy chunks in the North Atlantic. Is climate change to blame? Although evidence of a direct, global connection is unclear, in certain places changes have been dramatic. For example, Greenland’s Jakobshavn Glacier was undercut by warmer ocean currents, and it has completely disappeared. At the other end of the planet, the Antarctic ice shelf named Larsen B, after being stable for 10,000 years, in 2002 collapsed in just six weeks. Scientists are studying the connections among the disappearing glaciers, icebergs, and the 4- to 8-inch rise in sea levels over the last century. Their dangers aside, another remarkable aspect of icebergs has recently emerged. They are really noisy! 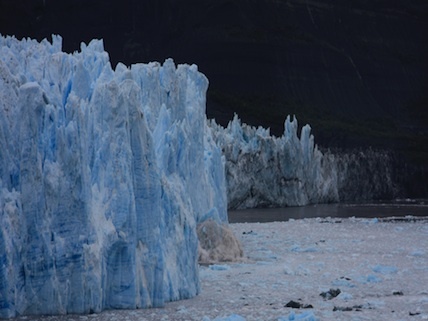 An Oregon State University team recorded a thawing berg near Antarctica. A team member predicted that the ice island’s groans, rumbles, and cracks could be heard as far away as the equator! Go to the Live Science link below to hear the sounds for yourself. Titanic Would Encounter More Icebergs Today? What is the connection between global climate change and icebergs? This page provides some insight. Listen to icebergs as they hit land, bump into each other, and crack. The audio accompanies animated diagrams. Watch as 7.4 cu. km (1.78 cu. mi.) of ice splits off of a Greenland glacier. This is truly awesome! This website combines material from several sources, including videos, maps, photos of different kinds of icebergs, and other features. Thanks Harcourt, this helped me with my current event. what was the exact date?